Part Ten – Not Route 66, just Route 6, but at least there’s an Elvis. Editor’s Note. It seems that this article was originally assembled using external links to the photos, and these no longer work, so unfortunately they are lost. Driving thru major cities and heavily populated areas do have some interesting places, but I reckon boredom could set in…so a quick discussion with myself, it is decided we will bypass those places and head toward Jerusalem and bypass to road 90 at the north end of The Dead Sea…and then will head NORTH ON 90. Then to much more exciting places. So now, I take the shortest route and get to Highway 6 (Kvish 6) to experience a short portion of that excellent highway. I wrote a story elsewhere about that experience and its worth repeating here while we stop for a while at Herzl Forest and a quick visit to Engineering Forces Monument ( the highway story is told to you now while we take a coffee break…on the lawns at the monument. Once, way back in the past – when I was still new to scootering – I remember vaguely having read something about an “Across Israel” (Highway 6) that was being built to be called Kvish 6. Then sometime later I read a sentence somewhere that the first 18 kilometers were ready and would be opened on some date or other. So, one day while scootering around, I came upon a road that was freshly tarred and was newly painted with pure white lines (being a new onramp >>> onto a new road). So I asked a man in a van, “what is happening here?” He told me that Road 6 would be opening — in about 10 minutes, and IF I hung around I would be the first person to drive on it! About 10 minutes later, he told me to go! The FIRST motor vehicle on the new highway was “me on my scooter”, going south…. no fanfare, no fuss, no cutting ribbons (this onramp was near Eyal Kibbutz. I rode those 18 kms on this beautiful, clean, smooth, well-built road with absolutely NO TRAFFIC. Later, one car went past me, and also an official “Road 6 patrol van. So, all too soon I rode that 18 kms and went off at the new off ramp pointing to Rosh Haayin, and rode to a coffee shop at a petrol station to drink a cup of coffee. Then, about 30 minutes later, I decided to do the 18 kms going north…. NOW, this gets interesting… coz the new onramp is at the Head Offices of Kvish 6, and here was a big media event, TV people with cameras, newspaper people with cameras, many people with cameras… (except me, I never had a camera). There was a big party going on at the offices. Many important dignitaries attended the “official opening”, and the “first drive,” which is from the office block going north — to the Eyal off ramp ~~> 18 kms. I scooted in to the parking area and a woman ran up to me telling me “to get on the bus quickly, it’s waiting for me” (she thought I was a reporter from a newspaper). I soon sorted that out. So, I went into the lobby at the offices, a very posh affair with many people wearing suits. I was given an orange juice and a cookie and a couple of maps, then someone told me I must leave… So a few minutes later I scootered on to the new 6 going ~~> north. I have since traveled several times on this beautiful, well planned, well built, well looked after, Kvish 6 highway, and also recently completed, now has two new twin filling-station-rest-rooms-shopping-complex on BOTH sides of the highway…. one way down south and the other up north. IT IS A DRIVING PLEASURE. So I say…”Well done” and keep on adding new sections, and every time a new section was completed, I took a scoot to ride on it. The costs for a scooter are very little and I always feel safe riding on clean, litter-free roads. And all my trips have been in daylight hours. A couple of times there were queries about the account that I received, but they were always solved by very pleasant personnel. I learned that much of the processes are automatically done to completion by computers, and the bill is clear and straightforward. We need to squeeze a couple of hours visit to MINI ISRAEL…worth every minute and much more…all the model buildings and buses and trucks and soccer stadium and ports and cable-cars…and everything in Israel that is major importance is there in miniature….no problem with parking at the entrance, and obtaining a small electric golf cart to travel around in…Mini Israel is open on Saturdays, and is usually crowded so if you can manage during the week…better still. Another couple of hours minimum is a must visit to the Armoured Brigade Military Museum at LATRUN where all sorts of armoured vehicles and tanks and many assorted vehicles of war that were captured from the enemies..during several wars. Pay an entrance fee and get some brochures, a movie in English explains and knowledgeable guides take you around and explain many things. (CLOSED ON SATURDAYS)… altho many captured vehicles can be seen if you drive a few hundred meters on the side road to the end of the fence. As usual, walking shoes and cameras always. A short visit to the Monastery close by and a visit inside if you like climbing many steps…some days there are open air markets and food kiosks in the carpark. Of course plan your day to visit NEWE SHALOM, close to Latrun, a neighbourhood where Israeli and Arab live side by side. A quick stop at the hotel lobby for some good brochures and then take a slow drive (or even a walk) through the streets and see what can be achieved. Then we kadimah (move forward) coz our new journey has only just begun. We pick-up route #1 and head toward Jerusalem..and at junction at Abu Ghosh we make a detour and head for ELVIS INN…this delightful restaurant that remains furnished in Elvis Presley times and hundreds of photos on the walls are a reminder as we sit at a table with Elvis Presley, and his music is always in the background. Excellent service from a small snack to a full meal, and if you drink a coffee, you get to take the mug as a souvenir. I must mention the incredible toilets that cater for many tour buses that stop there. 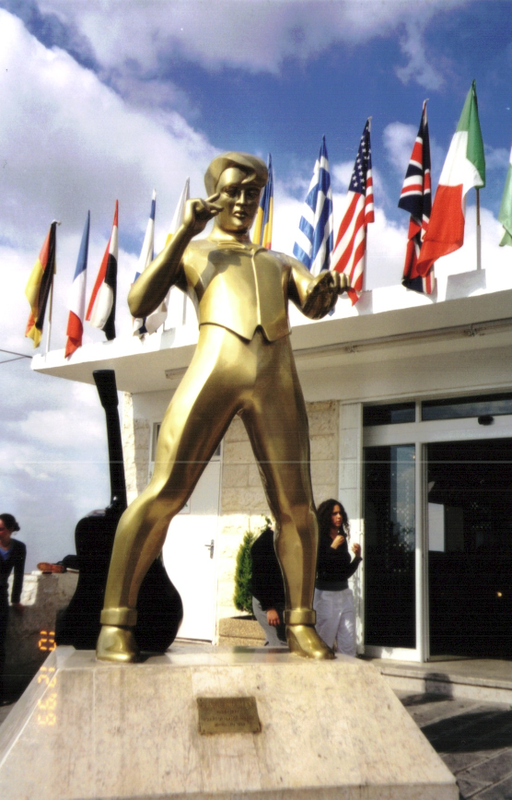 Outside in the carpark are many Elvis reminders including a magnificent “gold” statue of “The King Of Rock n Roll)..this is a “must” visit. As we may start our day very early and finish very late, I’m not suggesting sleeping time but for the record I have slept over several times at Yitzchak Rabin Youth hostel…which is nicely placed for restaurants and for leaving the city without being snarled in traffic. and at the end of #1 we coffeesnack at the same place we were at on an earlier time. We look at our mapatlas and plan our trip north on #90. (Very much more exciting than driving thru built-up areas surrounded by highrise buildings and shopping malls).